There are a lot of accountancy firms out there – some more suitable for contractors than others. Although it can seem like a big step, switching doesn't have to be a tricky process. 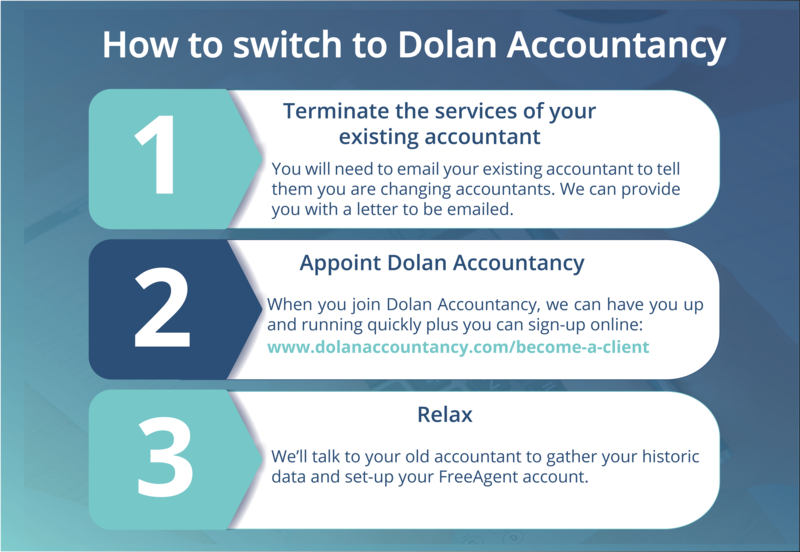 For more information or to discuss your options, please call us on 01442 795 100 or email jaime.thorpe@dolanaccountancy.com. Why might you switch accountants? High street accountancy firms take on a range of clients – from individuals like yourself, to larger businesses with tens or hundreds of employees. Although they may be very highly qualified, their expertise can lie elsewhere and leave you feeling like you are a square peg in a round hole. You may also find that you are de-prioritised ahead of larger clients who command bigger fees. A specialist contractor accountant will deal with companies just like yours day-in, day-out, meaning that they are always on top of current legislation and able to offer the best advice for contractors. Traditional accountancy firms usually have a range of fees for year-end accounts, VAT returns, payroll services, calls/letters, advice and bookkeeping. They might not be excessive, but a variety of fees are harder to keep track of and will see your costs fluctuate throughout the year. A fixed, all-inclusive fee, means that you can keep track of your outgoings more easily and you don’t need to feel hesitant about giving your accountant a call for some advice! Technology has revolutionised the process of running your own business. If you are still stuck photocopying and posting your receipts, manually raising paper invoices or handling all correspondence by letter, stop! A good contractor accountant will have systems and partnerships in place to make administration for your business a breeze, saving you valuable time to get on with your work. Dealing with different people or being unable to ask questions on your timescales can be difficult, especially when you are under time pressures with your work. A firm that offers a dedicated accountant will give a specific person you need to speak to, cutting down on wasted time and eliminating the need to repeat information.